My initial impression of poetry was that it was quite clichéd and simple. But after being introduced at the age of 13 by Leeds Young Authors who came to do workshops at my high school, I realised the impact of poetry did not just live in books; it existed in my surroundings and everything I encountered. A sublime universe. I’ve been writing for nearly 3 years now and my creative journey has been truly phenomenal, from taking part in workshops or watching others perform. I’ve been emotionally overwhelmed and philosophically challenged by the words of others and more importantly, inspired by them. Yes – sometimes poetry presents concepts I personally find provocative but that’s what poetry does, it lights sparks in people. 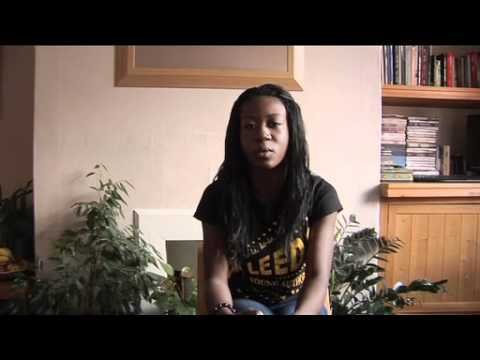 Patricia Bongani is a member of Leeds Young Authors. She was part of the Yorkshire team that won the WORDCUP, was last year’s team captain for Brave New Voices and has won the Voices of A New Generation team slam with Ralph Thoresby High School in both 2009 and 2010.